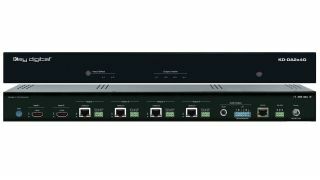 The What: Key Digital has introduced the KD-DA2x4G and KD-DA2x8G high-performance 18Gbps HDMI distribution amplifiers providing two HDMI inputs to four or eight respective HDBaseT outputs. The What Else: What separates Key Digital’s latest distribution amplifiers feature front-end switching selection to enable different content to be distribution to all four or eight screens up to 100 meters away at 1080p resolution or 70 meters / 250 at 4K. All four or eight monitors are connected via included long-range HBaseT receive units. All receive units are powered by the KD-DA2x4G and KD-DA2x8G, relieving integrators from the troublesome task of plugging in power supplies behind each monitor. KD-DA2x4G and KD-DA2x8G includes an assortment of integration tools. The auto-sensing feature will automatically switch to a newly detected source or from a newly disconnected source via Hot Plug Detection voltage when enabled. Analog and digital audio de-embedding of the selected source enables the distributed video content to also be fed into connected audio systems. Control pass-through enables IR or RS-232 signals from a professional control system to control connected monitors or be collected from an Rx unit and sent to the main equipment rack location for control of a selected source. The KD-DA2x4G and KD-DA2x8G offer Ultra HD/4K resolution support at 4096x2160 or 3840x2160 24/25/30/60Hz at 4:4:4 (signals up to 18Gbps bandwidth), signal extension of 4K/UHD up to 76 meters using Cat-5e/Cat-6/Cat-6A/Cat-7, and signal extension of 1080p up to 100 meters at 18Gbps bandwidth for the latest HDMI standards. These distribution amplifiers offer resolution support of all SD, HD, VESA (VGA, SVGA, XGA, WXGA, SXGA, UXGA) up to 4096x2160p, HDCP 2.2 forward and backward compliancy up to HDCP 2.2, High Dynamic Range (HDR) format support of HDR10 and Dolby Vision, and deep color support up to UHD/4K 60Hz 4:2:0/12 bits, 60Hz 4:2:2/12 bits. Key Digital’s HDR10 delivery is handled as part of its proprietary Full-Buffer Technology (FBT). The KD-DA2x4G and KD-DA2x8G feature EDID Control with a built-in internal library of 15 EDID handshakes in addition to the ability to copy the EDID data from the display connected to output/display one. The Full Buffer System manages TMDS re-clocking / signal re-generation, HDCP source and display authentication, Hot Plug Management, and EDID Control handshake. Supported lossless compressed digital audio formats include Dolby TrueHD, Dolby Digital Plus, DTS-HD Master Audio, and Dolby Atmos. The Bottom Line: KD-DA2x4G and KD-DA2x8G were designed for a superior distribution system without signal degradation, offering performance and reliability while still remaining cost-effective. These products join a suite of Key Digital IP enabled products that are now app ready. The engineers at Key Digital have created a simple way for installers and users to switch inputs of the video distribution system as if you were standing in front of the unit - all from your iOS device. The Key Digital app can be downloaded free from the App Store. The KD-DA2x4G and KD-DA2x8G also support the Key Digital Management Pro Software (KDMS Pro), is Compass Control Pro ready, and is fully controllable by all IR, RS-232, and TCP/IP supported control systems via open API.